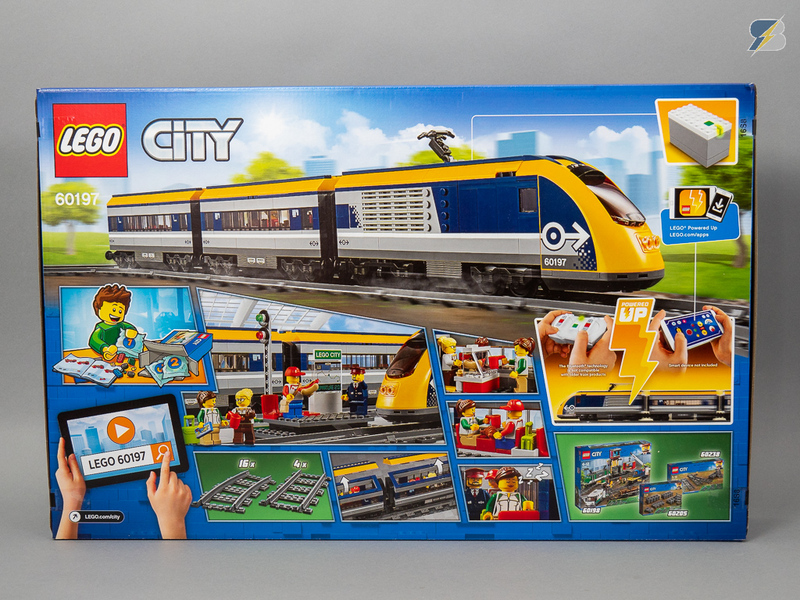 The set comes in a fairly big box with the train and the (very) small station visible on the front. The dimensions of the box are 58 x 38 x 9 cm, it weights 2 kg. 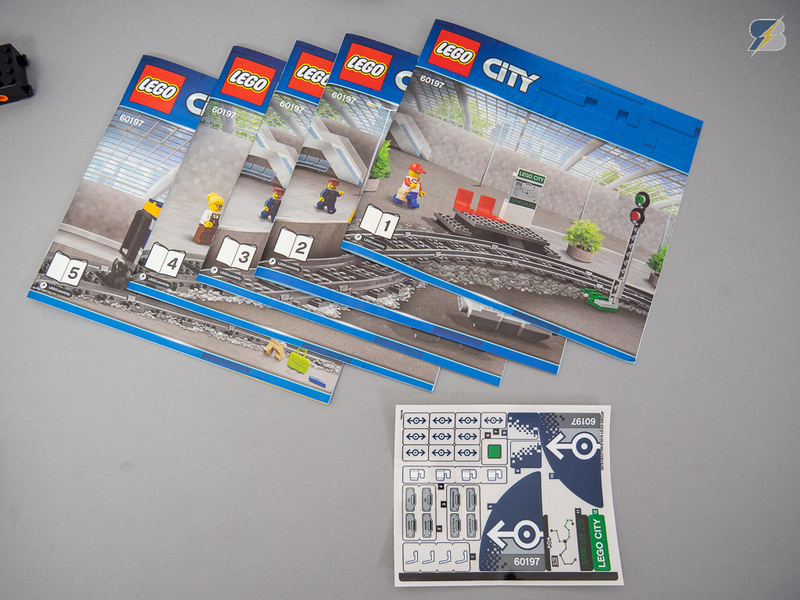 A lot of details are visible on the back, you can see the minifigs in different scenarios on the train and on the platform as well. 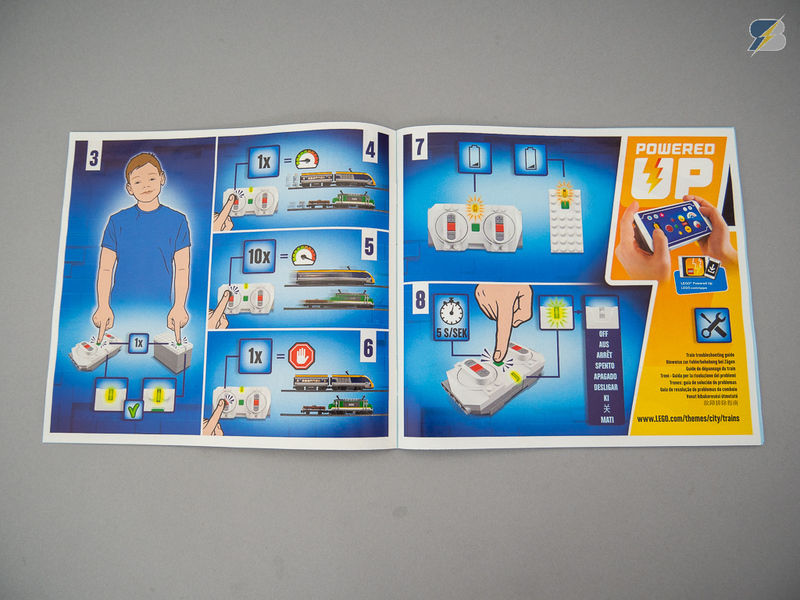 There’s some basic information about the Powered Up system and some additional sets that can be used to extend the set. As it is indicated on the box you need to have a compatible tablet or phone to run the Powered Up app. 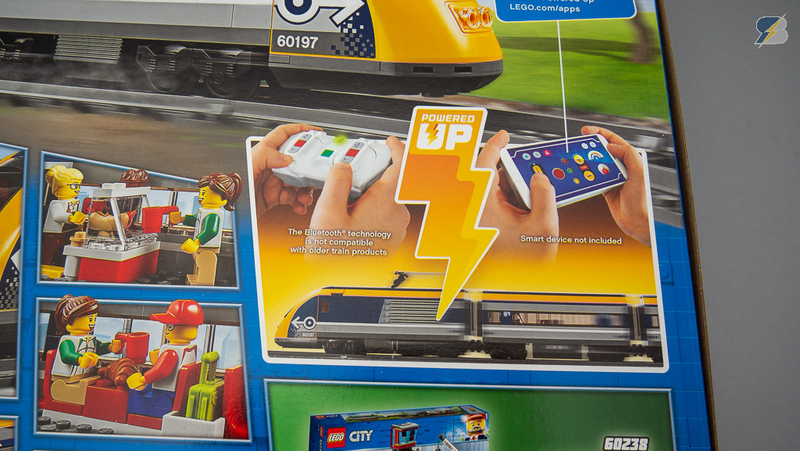 Since the new remote uses Bluetooth connection you won’t be able to control the previous Power Functions equipped trains since they had infrared connection. 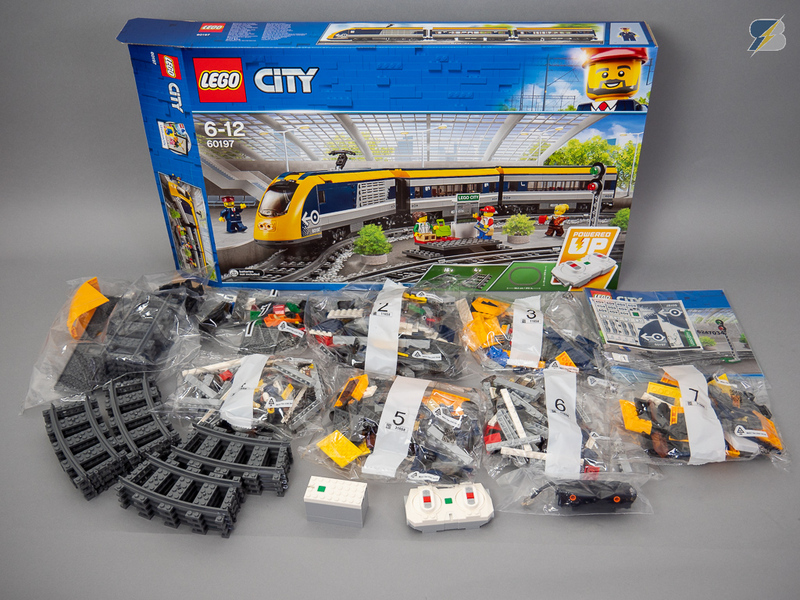 Inside the box there are 7 numbered bags, an unnumbered bag with some bigger pieces, the tracks, the Powered Up components and the manuals. 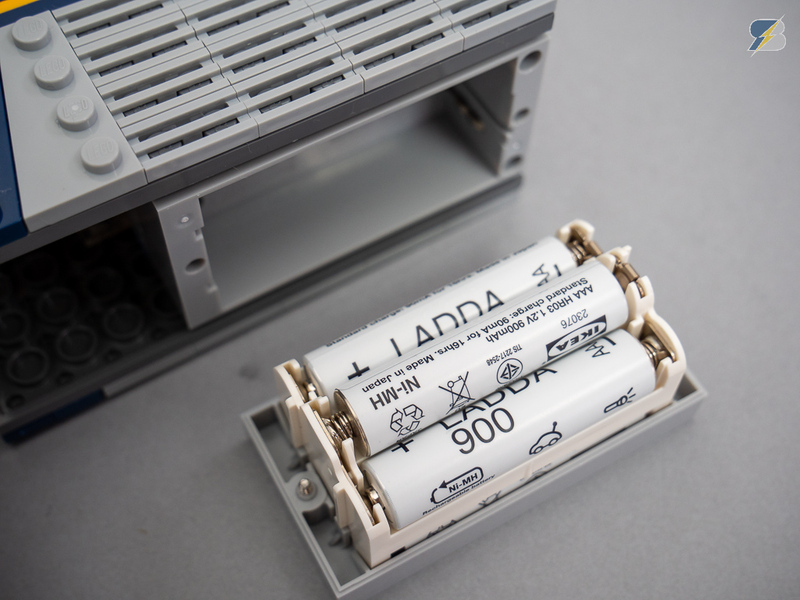 You’ll need an impressive amount of 10 AAA batteries to run the train, this is 1 more than the previous Power Functions trains. 4 batteries needed for the remote and 6 for the hub. 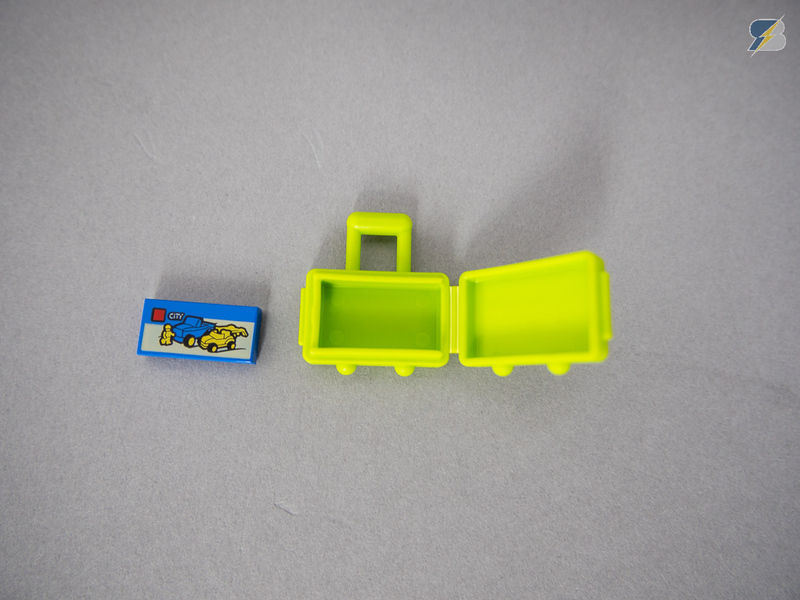 Both units have their cover secured with screws so you’ll need a screwdriver to open them. 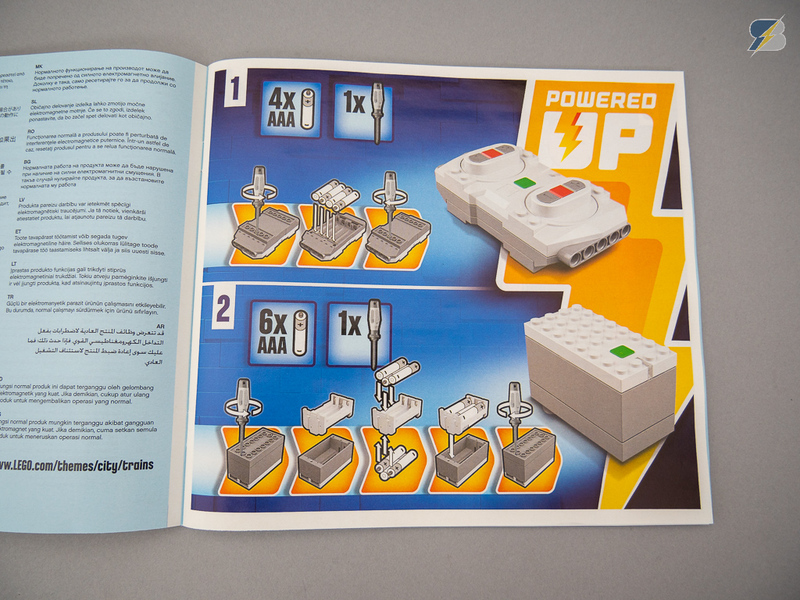 On the next page you can see how to pair the remote with the hub, how to control the train (it has 10 speed levels), how the hub will indicate when the battery level is low, and how to turn off the units. Interestingly some additional operations are not shown in the manual, like the switching of channels or how to unpair the remote and the hub. Check out the video to see this in action. The new Powered Up hub has the same size as the previous Power Functions AAA battery box. It has two connectors on one end. 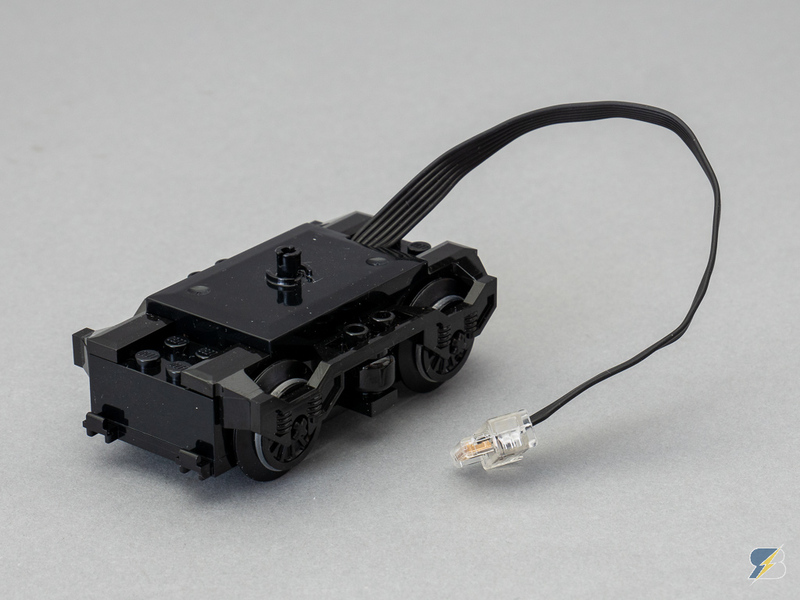 Since the new connectors are not stackable, currently this is the maximum amount of components that you can attach to a hub. 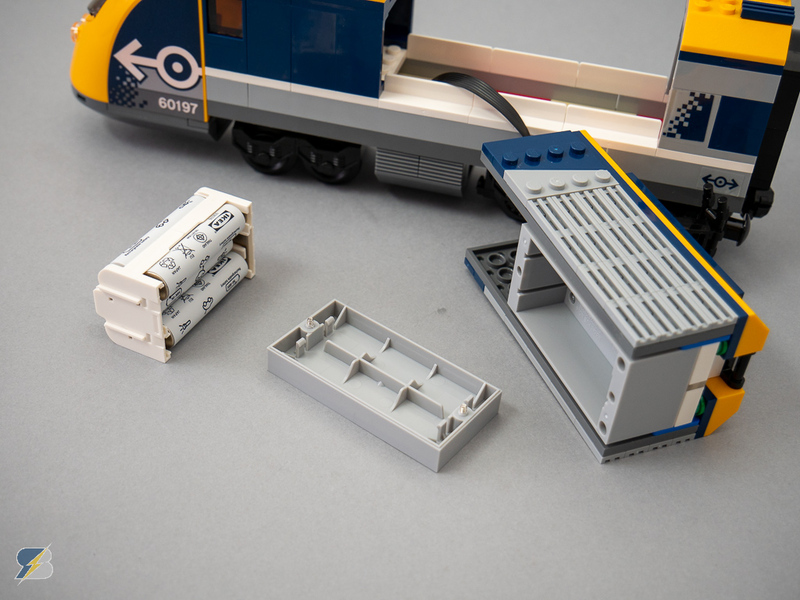 The remote is smaller than the previous Power Functions train controller. 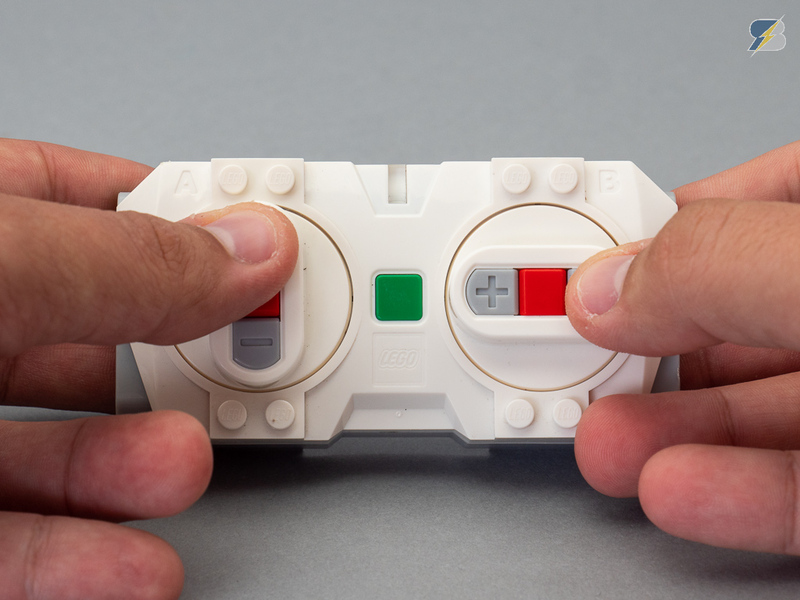 Instead of the dials it uses buttons, and the base of the buttons can be rotated. 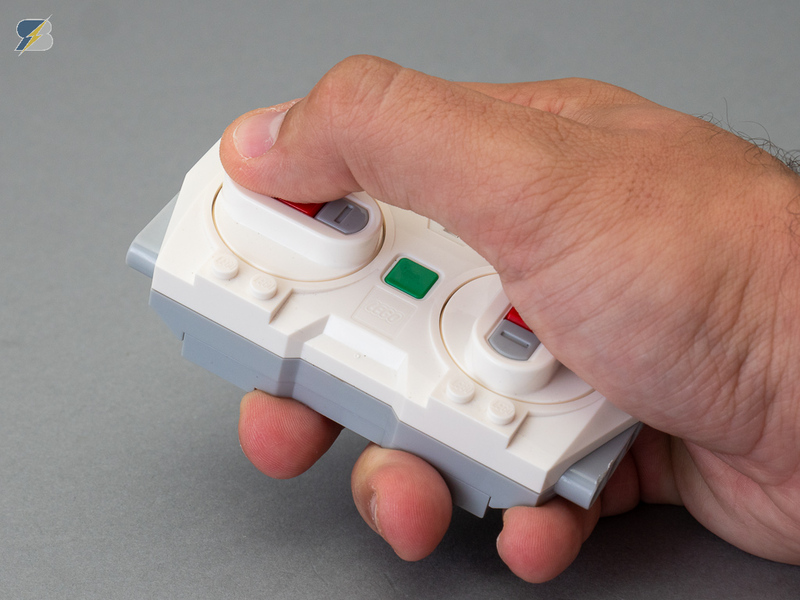 It gives you some additional options to hold the controller in your palm for one-hand operation, or in the future to turn one side 90 degrees for steering control. Unlike the previous Power Functions train controller you don’t have any visual feedback about the current speed applied. 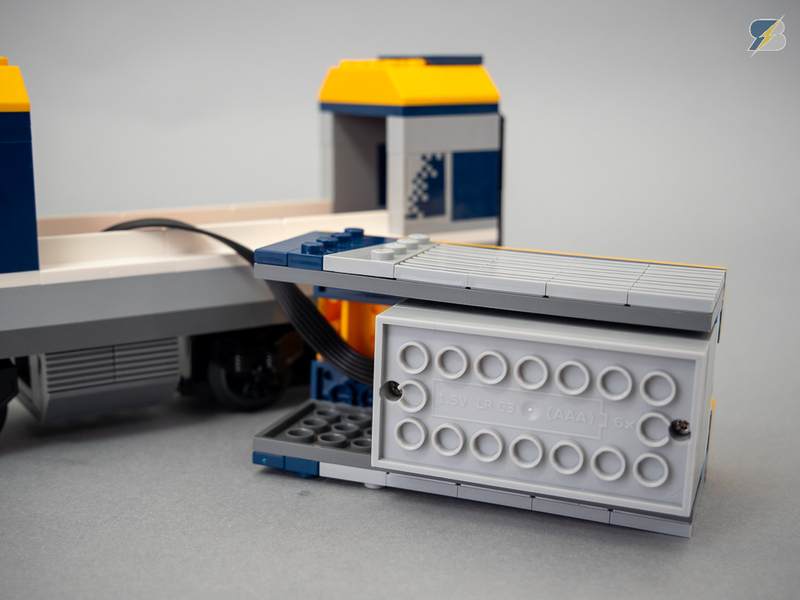 The new train motor is pretty similar to the previous one, only the cable and the connector is upgraded. 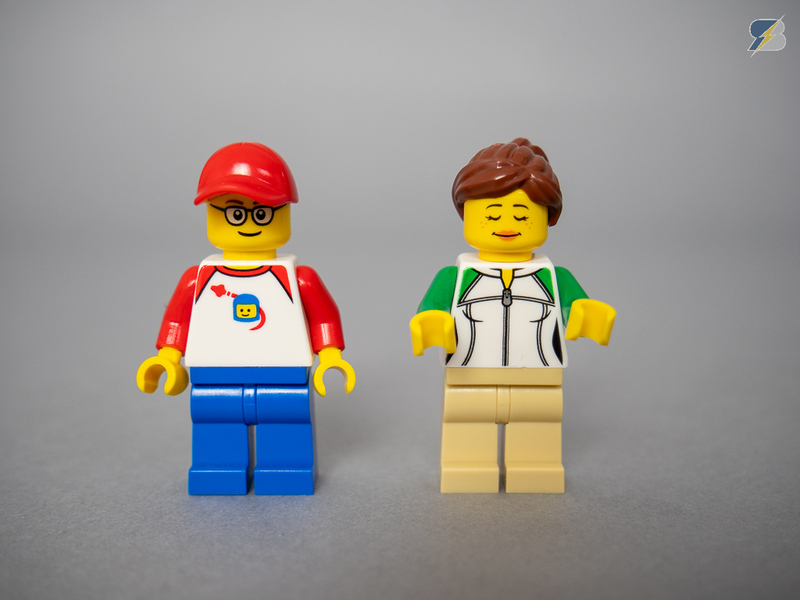 The boy has a cool classic LEGO Space t-shirt. The lady is the only figure from the set who has an alternate face, as you can see she has a sleeping one as well to take a nap in the passenger car. 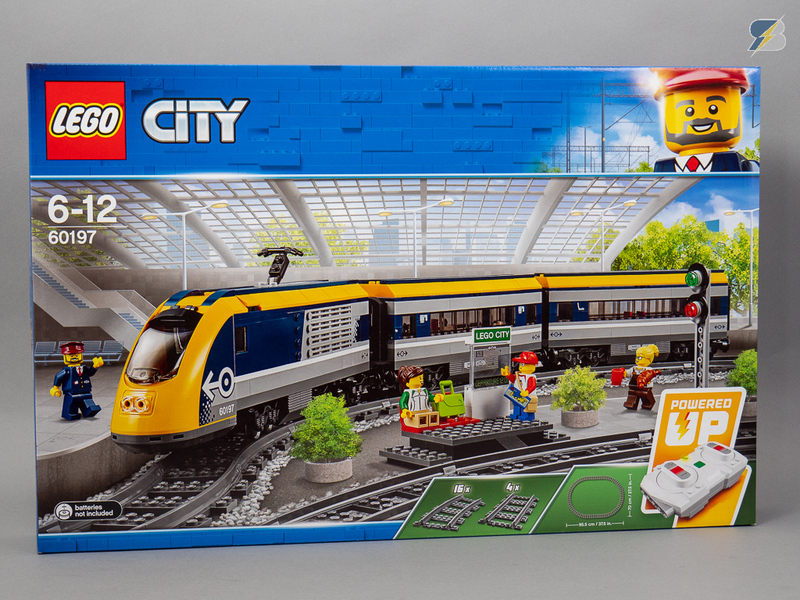 The station is probably the most disappointing part of the set. it is very minimalistic, it has barely any features. Apart from the lights there are no additional buildings or accessories. 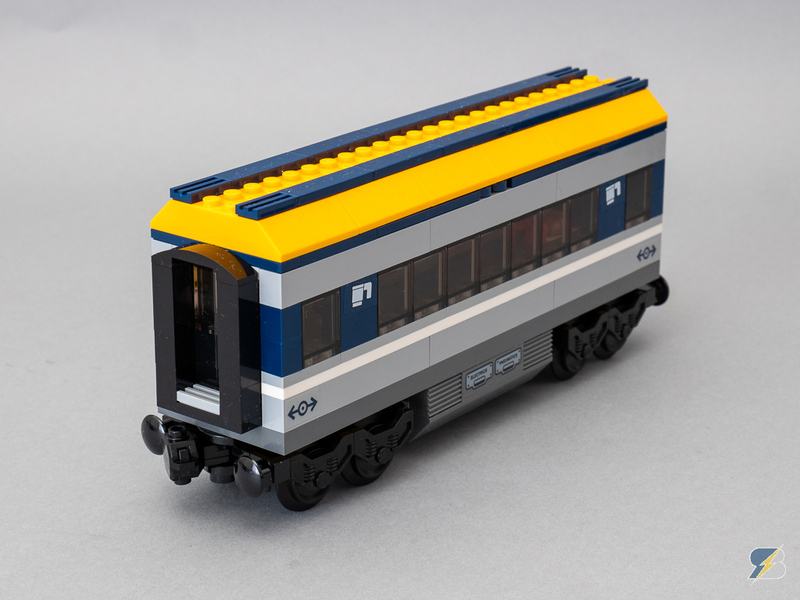 The locomotive has a nice brick built color pattern with some stickers and a single big piece in the front. 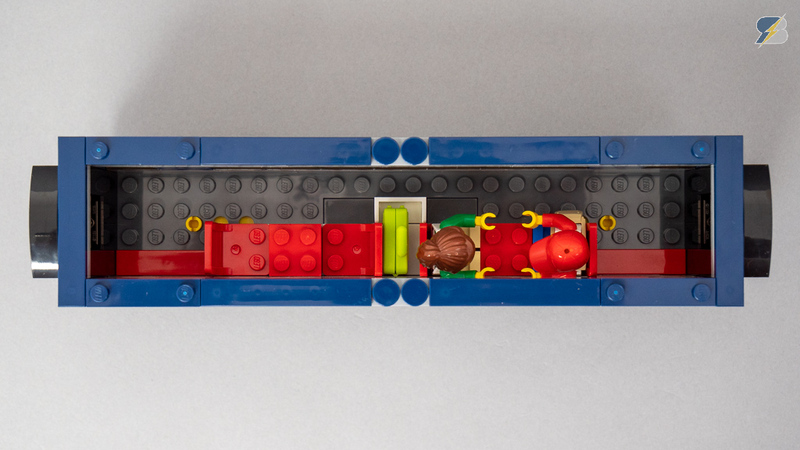 Unfortunately there’s no space inside for the passengers, only the driver sits in the front. After unscrewing the two screws the battery holder can be removed. 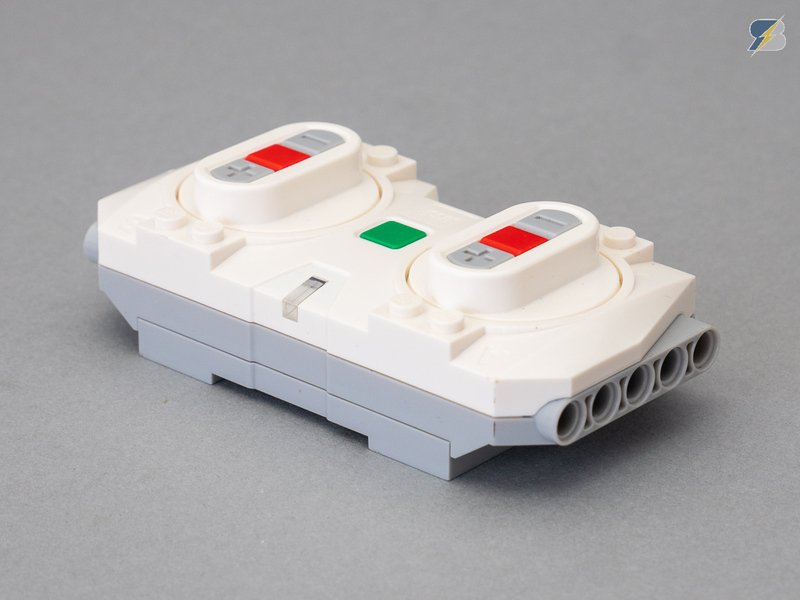 The battery holder itself can be detached from the bottom cover to access all 6 battery slots. 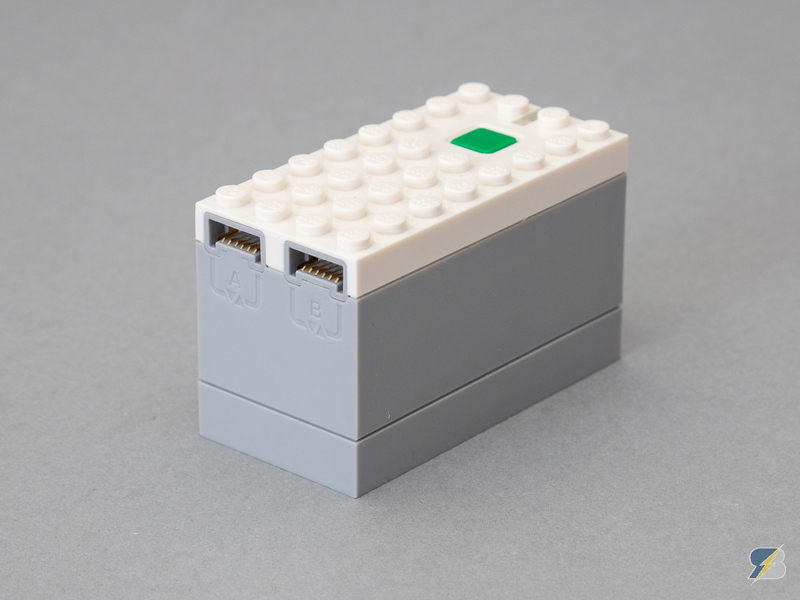 The battery holder has some notches on the side that helps with the proper alignment – one on one side and two on the other. 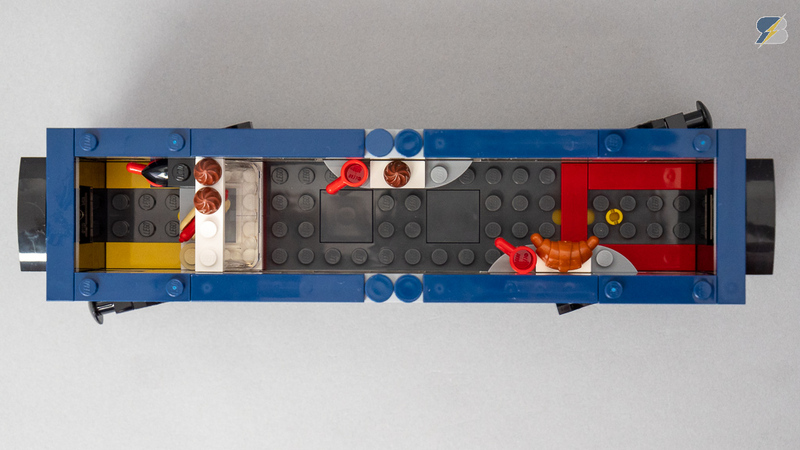 The café car is the next one with a removable roof and some tables. 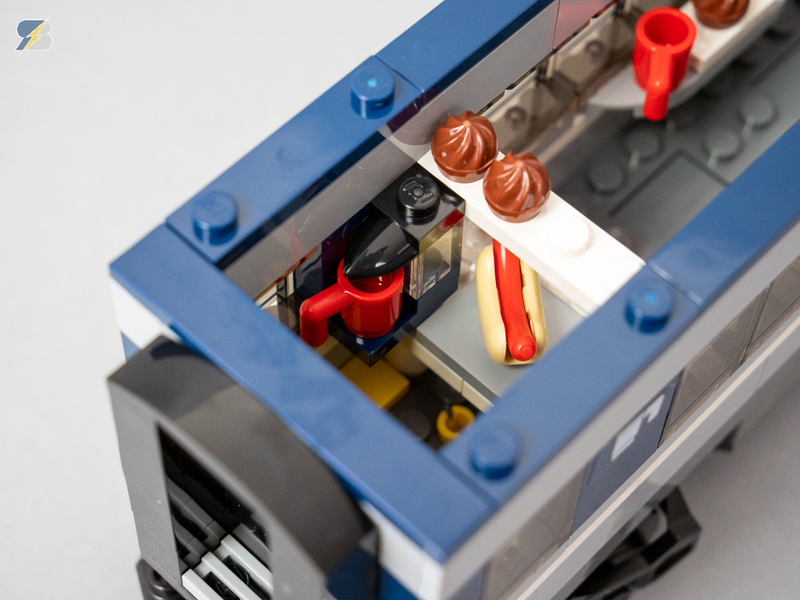 There are some nice details inside like the croissant, the cupcakes, the hot dog and the coffee machine. The passenger car also has a removable roof. Inside you won’t find many details, only some seats and tables. The only extra feature is a luggage holder in the middle. You can also see here how this train compares with the older Power Functions equipped 7938 Passenger Train. Apart from the different controls their operation and top speed is pretty similar. 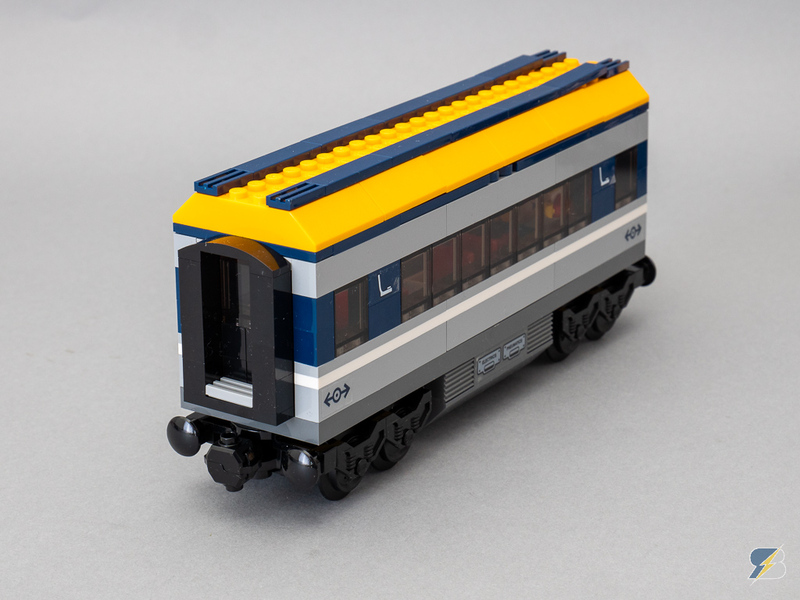 The 60197 Passenger Train fits in the line of the previous trains released by LEGO. It offers a similar functionality for a similar price level. The new Powered Up system is a great upgrade with a longer range and advanced controls, hopefully the functionality will be extended in the future. 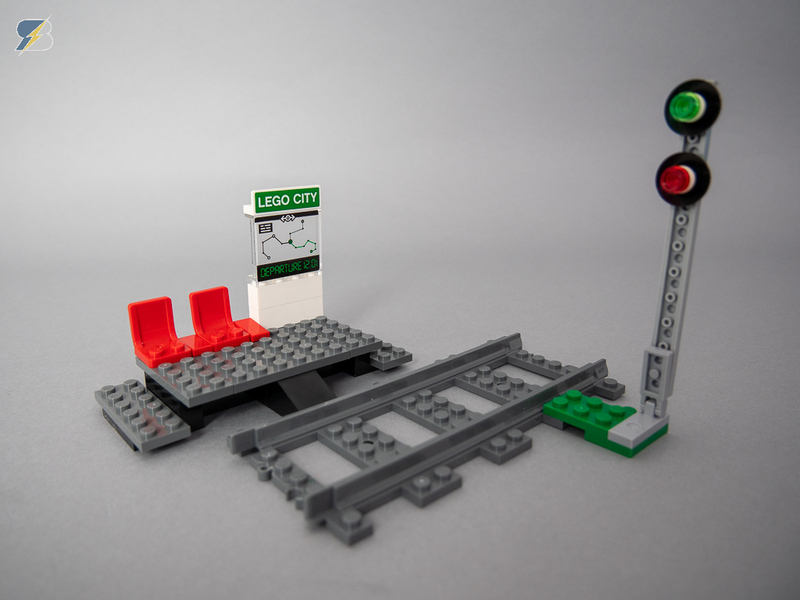 In August we can already expect a new Powered Up compatible LED light that can be added to this train set as well. The train itself is nice and fun to play with, unfortunately the tiny station is very disappointing. 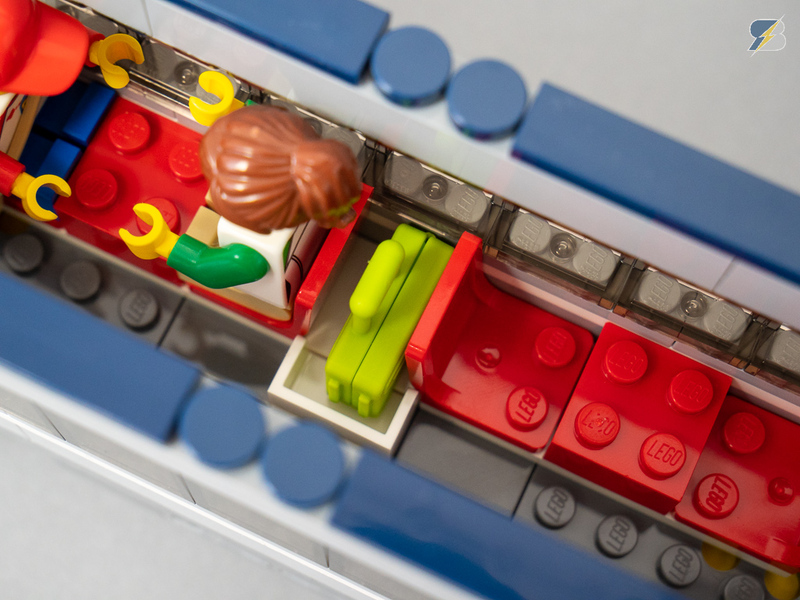 Even the previous 60051 Passenger Train set had a crossing besides the small station. 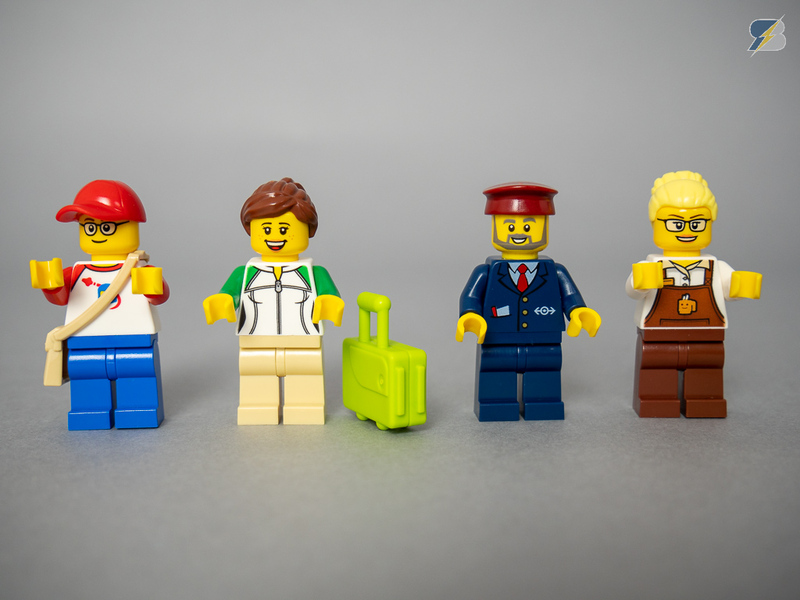 Would have been nice to see some extra in this set as well. 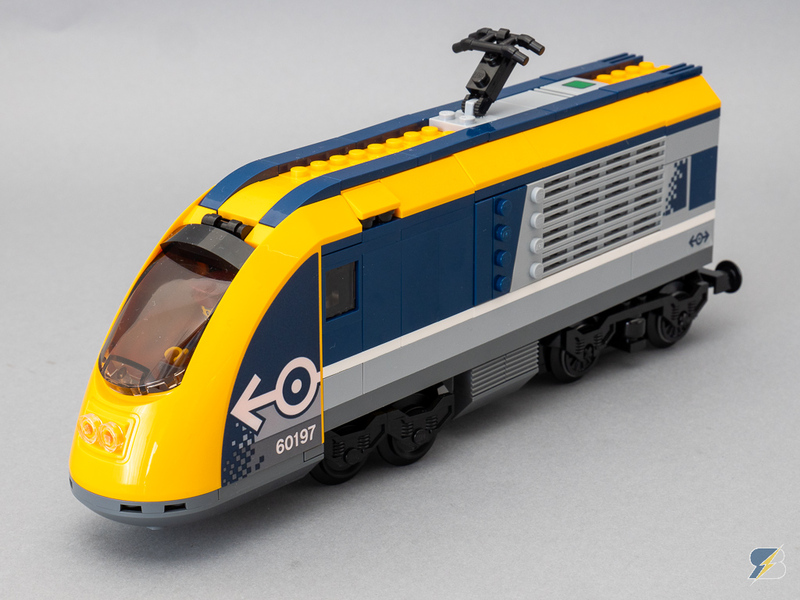 60197, Lego, passenger train, Powered Up, Train. Bookmark.